This driver definitely is showing some minor performance gains across the board. Getting more fps in SOTTR as well as FH4 here when compared to 417.75. Unwinder had nothing to do with nvidia inspector, and the error is because something else is already accessing the DRS binary file via nvapi so its not even a driver bug. Nvidia is aware that this set is producing TDRs on windows 7 and 8.1, but if anyone can check to see if disabling the driver container stops the TDR's that'd be a big help. OK, here is the *proper* Port Royal test for DLSS that I did not see before. So, I do have to say that a 19 FPS improvement is impressive. It's nice that it runs it twice and shows you a DLSS off/on comparison. 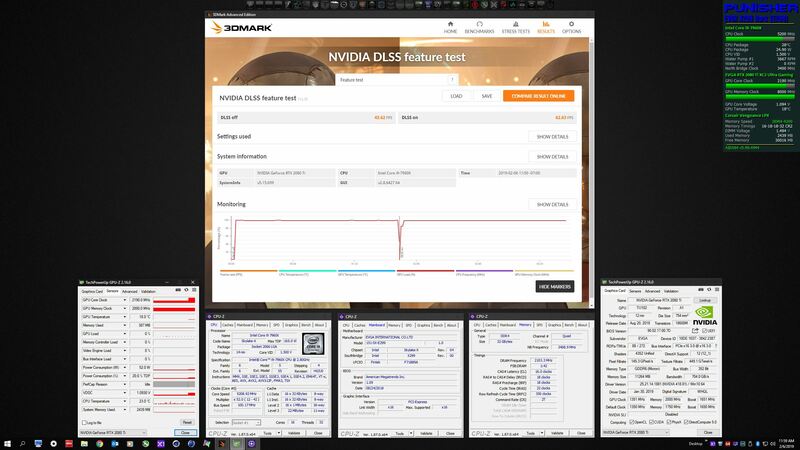 The performance of DLSS in this test sounds pretty good. How is the image quality in comparison with having it off? Mr. Fox and endbase like this. I did not notice any difference in the image quality between the two tests. It's too bad you cannot have control over it to turn it on and off whenever you want to. It's also too bad you cannot get a Port Royal score with DLSS on. It's useful for demonstrating the improvement, but after I have done it once it is only useful to me if I can get a score to post on HWBOT and have the ability to manipulate it (enable/disable) as a feature. Maybe that will come in time. If not, then I will have to view it as yet one more example of silly NVIDIA marketing gimmicks. There is definitely a massive difference in image quality with dlss on and off. Its not possible to miss the difference. Since there is no actual game to try the rtx and dlss features right now i bought the 3dmark last day with 85% discount offer just to see if dlss makes any difference or not. Tested it in a 4k 55inch samsung js9000 TV. Image quality difference is perfectly noticeable. Cave Waverider, Mr. Fox, dr_rus and 1 other person like this. Actually there is just not much. Final fantasy 15 uses dlss and battlefield 5 has rtx. I've got incredible boost in Division 2 beta with this drivers. I been getting some weird blackouts for a second when a couple applications are open on Win 7. Not sure anything really. Could be an application like word or adobe, but this driver seems to have an issue there possibly. Decided to install these, clean DDU install. No noticeable changes but Civ 6 seems to have issues with DX12 on these drivers. After a while the game gets stuttery and overall feels slow. Didn't have such issues on previous WHQL. upd: Reinstalled the driver on top of previous WHQL. Game seems to run better now but it still feels like it runs worse overall than it used it. I've been getting it in vivaldi (chromium). PITA. Your response made me curious, so I had to go run it again and pay closer attention. After re-running it and looking, I can definitely see an unmistakable improvement in the image quality. Had you not posted I possibly never would have noticed. It didn't grab my attention due to being profound and I definitely had to pay attention to identify the improvement, kind of like ray tracing... absolutely nice to have, but not something extremely compelling for me. So, thanks for prompting me to pay attention and look closer to recognize and appreciate it. firefox does nothing of the sorts. Known. the display container is consuming all commit space and leaving no memory for the driver. Multiple TDRs with these drivers, possibly related to Firefox or Discord. Rolled back, no problems. Well with these drivers when Im changing sound volume using my keyboard scroll (Corsair K70) the screen blinks in black. I think it has something to do with small horizontal volume indicator showing on screen when Im changing volume. Its kinda annoying and disturbs in a game. No issue here on a G610 with volume wheel. I do have hardware acceleration set off in LGS, so maybe that is something to look at. Someone who have 3 surround monitors with two rtx-2080-ti in Sli have encountered some issues with this driver release? Yeah very well could be firefox. No issues otherwise though. I finally started playing GTA V campaign last night and played for hours on end on my 1080ti. No issues at all. So I'm all good.